Scroll down to learn more about these inspiring individuals! 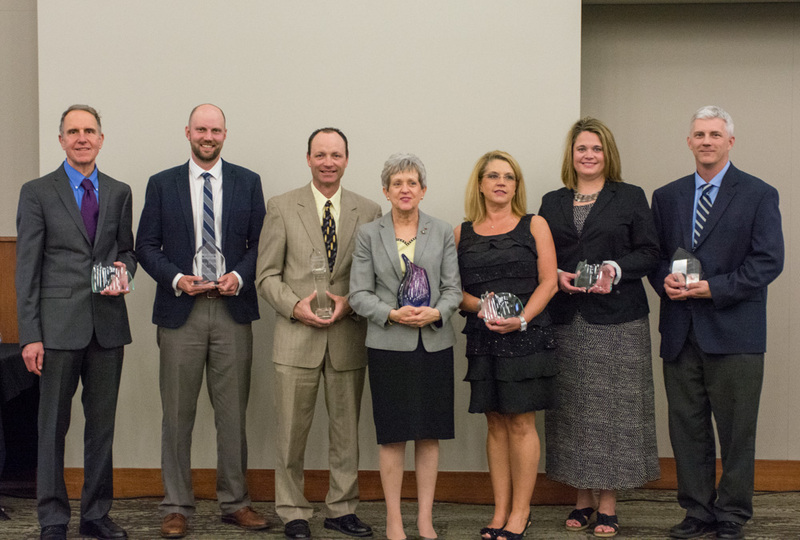 2018 Award Winners pictured left to right: John Grimes, Travis Lucas, Desi Irish, Jeannie Sands, Sherla Post, Will Tolliver, Troy Marker, Andrea Thieman, John Skretta. John Skretta, Norris School District #160 was the recipient of the Lifetime Wellness Ambassador Award. Named the 2017 Nebraska Superintendent of The Year, Dr. John Skretta has created a culture in a school district which is sought after, appreciated, respected, and continues to be cultivated. His leadership, knowledge, and fortitude have emphasized the importance of the health and wellness of his students, his staff and himself. Dr. Skretta was an invited speaker for the Let's Move Active Schools national rollout, joining First Lady Michelle Obama on a conference call which included other key leaders in student health and nutrition. He was also an invited participant at the Let's Move! Active Schools Leadership Roundtable 2014 White House Event sponsored by the President's Council on Fitness, Sports and Nutrition. Though Dr. Skretta's educational and career resume is impressive, it is no more impressive than his commitment to his family. John and his wife Sara have four sons, Tony, Coby, Sam, and Ben. Dr. Skretta has run in over 25 marathons, including numerous adventure races and a 50-mile ultra-marathon. In every part of Dr. Skretta's life, he transcends what others expect, and gets others to a greater place in this world. This cannot be etched on a trophy or on a plaque: it is what Dr. Skretta has afforded the staff and community at Norris School District. John Grimes, Associated Wholesale Grocers Inc. was the recipient of the Lifetime Safety Ambassador Award. John Grimes has been committed to safety and wellness since he began his employment with Affiliated Foods Midwest in 1979. John regularly shares his knowledge and experience with local organizations and associations through leadership on boards and committees, presenting on safety and emergency preparedness, consulting, conducting trainings, or acting as a sounding board for his peers. John devotes his free time to his family and his church as worship leader and was heavily involved in the building of their new church. John performs in the Norfolk Men’s Chorus and is a member of the Norfolk Noon Optimist. When he finds spare time, he remodels homes; including cabinet making and roofing. Andrea Thieman with the Nebraska Risk Management Association was the recipient of the Wellness Professional Leadership award. In addition to her full-time duties, Andrea created and has steadfastly led the Nebraska Risk Management Association wellness initiatives since 2007. The NIRMA Director states that he “has personally witnessed staff members make meaningful lifestyle changes which have unquestionably improved their long-term health prospects due to Andrea’s efforts.” Andrea's passion in this area extends well beyond the office as she regularly offers her encouragement and assistance to the 81 Nebraska counties NIRMA serves, some of which have developed robust wellness programs of their own. Andrea has demonstrated the dedication, commitment, and qualities which make her deserving of this award. Jeannie Sands of Lincoln Surgical Hospital/Eye Surgical Associates/Sutton Ryan Dermatology was the recipient of the Wellness Professional Leadership award. Jeannie has been the Wellness Coordinator for Lincoln Surgical Hospital/Eye Surgical Associates/Sutton Ryan Dermatology for more than 8 years. Jeannie has exhibited a drive to success, not only in her own professional career but in the lives of others. Jeannie’s supervisor states, “In my role as Chief Human Resources Officer and Jeannie's direct supervisor, I have been able to witness, first hand, the unique qualities Jeannie exhibits both as a leader and as a resource for our employees and their family members. Jeannie's knowledge of health and fitness and her compassion exemplify the standards we strive for in our leadership team. Sherla Post of Cornhusker Bank was the recipient of the Wellness Professional Leadership award. Sherla has been one of the executive sponsors for Cornhusker Bank's Wellness Program since its inception. She has been a constant advocate, promoting and supporting many wellness activities and leading by example. Her personal involvement and commitment to a healthy lifestyle are always present. She is an excellent communicator and takes the lead in meetings but makes sure all members have a voice and lead in the areas of their interest. She and the other executive members advocate annually for the funding to be included in the budgeting process. Desi Irish, MP Global Products was the recipient of the Safety Catalyst Award. Desi has helped fix cited OSHA violations to compliance levels, as well as to translate communications in Spanish so all employees understand procedures and safety protocol. Desi has implemented an injury prevention program where coworkers are looking out for employees that are not wearing safety glasses nor working in a safe manner. She follows reports with education about the importance of following procedures and standards so they become compliant before an accident occurs. Safety communication is regularly part of monthly supervisor meetings to escalate the expectation across all levels of the organization. Travis Lucas, Sampson Construction was the recipient of the Wellness Catalyst Award. Travis joined Sampson Construction last year as the wellness coordinator. He immediately developed a strong rapport with employees, gaining their trust and buy-in as he implemented several wellness initiatives. He is a good listener, relates to people well, and is a can-do person with a passion for wellness and serving others. Travis has "moved the needle" at Sampson regarding wellness, employee engagement, and company culture. He has been a true catalyst. Recently, Travis has been promoted to HR Director of Sampson Construction, where he has a bright future ahead of him. Great work Travis! Will Tolliver, Lincoln Industries was the recipient of the Safety Catalyst Award. Will Tolliver was promoted to Safety Technician at Lincoln Industries in September of 2016. Will is extremely passionate about safety and always brings a positive attitude to work. He finds that he can be much more influential when he focuses on serving others and helping them achieve their own work goals. Will has been a catalyst for helping grow the culture of safety by leading a group of environmental, health and safety representatives, and a new incident investigation process. Monthly audit scores have improved nearly 10%. The new incident investigation process has resulted in nearly double the number of incidents and near misses being submitted which opens the door to team-based problem solving to eliminate the potential for future incidents. Troy Marker, Hexagon Lincoln was the recipient of the Wellness Individual Champion Award. Troy epitomizes the concept of "total wellness" and serves as a personal example of how small, personal changes can make an enormous difference. As a member of the Hexagon Lincoln Wellness Committee, Troy proactively shares his fitness and wellness passion with others and is truly an individual who motivates and inspires others to make healthy improvements! He is always willing to share his wellness and fitness knowledge despite navigating a very busy schedule of working full time, a second job, and serving as a husband and father. Congratulations Troy Marker, your commitment and engagement have had a significant impact on the people of Hexagon. Pictured above left to right: Laurie Klosterboer, Nicole Osborne, Dan Krick, Kathy Helmink, Craig Cassel, Jeannie Sands, Donna Bruns, Peter Metzger, Governor Pete Ricketts, Marc LeBaron, Brian Cross, Kay Sudbeck, and Lisa Henning. Marc LeBaron, Owner and Chairman of Lincoln Industries was the recipient of the Lifetime Wellness Ambassador Award. More than 25 years ago, Marc decided that wellness would not be a standalone program, or just another benefit. He decided to fully integrate wellness into every aspect of the company culture. Marc’s leadership in the community and influence among business leaders, both locally and nationally, has helped create a shift in how companies invest in worksite wellness. He actively shares the LI wellness story to promote the benefits of what it can do for a company. When asked about the value, Marc sees it as much more than a basic ROI. Marc values people and sees this as the right thing to do. He knows how wellness has changed people’s lives for the better and connects them to their work. There is no dollar value that can accurately capture the return. He passionately believes that executive leadership is vital to successful wellness for the people of LI. Marc severed on the WorkWell Advisory Board and the Nebraska Safety Council Board. He expects L.I. leadership to help businesses create a culture of health in our community, state, and nation as well. To celebrate the success L.I. people make in wellness, Marc invites over 300 people each year to climb a 14,000 ft. mountain in Colorado. Marc is an active participant in the trip and personally congratulates people on their accomplishments. Probably one of the truest tests to his commitment to wellness came during our recession in 2008. He made an active decision to keep the wellness program alive while many companies cut the program during tough financial times. Dan Krick with Hexagon was the recipient of the Leading by Example award. Dan is a leader in both his personal and professional life. Dan joined the Hexagon team two years ago and hit the ground running, literally. He went to work on many tasks and his love for wellness shined through immediately. You can almost always count on him to incorporate a question or two into the conversation about your overall wellbeing! He cares for others and is always the first to celebrate their successes! Dan lives with a passion for wellness and finds ways to incorporate it into his daily life while encouraging others to do so as well. His leadership has brought many fresh ideas and a cultural change to the organization. Dan is well deserving of this award for his leadership skills in the wellness field and for the positive impact he has made at Hexagon and the in community. Kay Sudbeck of Speedway Motors was the recipient of the Leading by Example award. Kay has a personal passion for wellness and is a role model to many. She is a fitness enthusiast who starts every day with a good workout. Kay enjoys riding her bike both competitively and leisurely, gardening, and stays active with her friends, family, and grandchildren. Kay brought to light the importance of a wellness program and has played a vital role in making Speedway Motors Wellness Program what it is today. Thanks to Kay and the Smith Family, Speedway offers a variety of wellness programs to employees and spouses. Kay is a true wellness champion not only in her personal life, but to many of those who work with her at Speedway Motors, Speedway Properties, and the Speedway Museum of American Speed. Brian Cross, Bryan Health was the recipient of the Breakthrough Leader Award. Brian has demonstrated a commitment not only to Bryan employees, but to the community of Lincoln and surrounding communities. He has helped decrease the employee tobacco rate from 10% to 4% in 3 years. He offers several services and classes for employees including an annual wellness screening for more than 2,600 people. He is a resource for the community, helping guide others on how to implement and sustain wellness programming. Brian is a person of integrity. Brian meets people where they are in life. He does not pass judgment and helps them problem solve. Mr. Cross exemplifies Bryan Health’s core values, but the one that stands out is “know the way, show the way” in his ability to lead people and promote a healthy lifestyle. Kathy Helmink, Bryan Health was the recipient of the Wellness Leadership Champion Award. Kathy's passion for supporting people with diabetes took on a whole new level this past year. Kathy put her talent and skills to the test when the Bryan Diabetes Center began working with corporate groups and community members to provide the CDC's Diabetes Prevention Program. She has counseled over 40 participants from Bryan Health and Kawasaki. The Kawasaki group alone has lost 179 lbs. Kathy is a Certified Diabetes Educator and has been a long-time advocate for personal health and wellbeing. She is an avid runner and cyclist. Kathy just completing her first half marathon with her children this past Sunday. Paul Utemark, Fillmore COunty Hospital was the recipient of the Wellness Leadership Champion Award. As CEO of Fillmore County Hospital, Paul has made an exceptional impact on the lives of Fillmore County Hospital employees by very intentionally creating a culture of health and wellbeing at the worksite. He implemented a "daily pledge" initiative focusing on personal and professional values, an advanced clinical risk management program for employees and spouses, and offers behavioral health services as well. Paul has continued to advance and support these initiatives even while battling an aggressive cancer. Peter Metzger, Lincoln Industries was the recipient of the Wellness Leadership Champion Award. Peter started his journey while working on 3rd shift as an electroplater during a morning workout group with his team members. As Peter has taken on new roles at LI, he continues to bring his health and wellness leadership to each department. He has served as a member of both the wellness and safety committees for the past four years and in the past two years has taken on a leadership role. Peter leads many health and safety events and has taken on a role as a trainer in a fitness center where he works at least two days a week helping others reach their goals. He has a caring mentality and truly invests in contributing to the success of others. People are willing to follow his lead because of the commitment and success he has in his own personal health and wellness journey. Bethany Worster, Lincoln Surgical Hospital was the recipient of the Wellness Individual Champion Award. Bethany has tried many different diets over the years. Of course, they never stuck. She went to her doctor and had full blown metabolic syndrome. Bethany made some changes. With Bethany’s permission to share her outcomes... her weight went from 194 to 148 pounds, total cholesterol down from 261 to 214, HDL’s increased from 53 to 61, and triglycerides are down from 197 to 130. Bethany now no longer has metabolic syndrome, but more importantly, says that she can play games with her kids. Craig Cassel, QC Tech for Molex was the recipient of the Wellness Individual Champion Award. In April of 2015, he didn’t have the energy to do the things he wanted, so he swore off all the junk food, cut back on sugar and started to work out. Craig has lost 101 lbs. and has been able to keep it off. He says he feels “a thousand percent better” and his advice to others is to not give up on yourself and don’t lose faith. Even though Craig is a big Kansas State fan and likes to wear his “purple” to work, he deserves to be recognized for his amazing weight loss and the desire to want to make his life better. Donna Bruns, Fillmore County Hosipital was the recipient of the Wellness Individual Champion Award. Donna is a walking inspiration. In February of 2016 she decided it was time to take control of her own health because she was "tired of being tired." Donna started eating better, used myplate.gov to help track her food intake, turn down food temptations at work, and bring healthier versions of food to share with coworkers. Donna began exercising walking and strength training. Donna has lost 80 pounds and gone down 8 sizes in clothing. She has also reduced her risk factors and no longer possesses Metabolic Syndrome. You can see a difference not only in her appearance but her demeanor as well. She smiles a lot more and seems to have more confidence. Fillmore County Hospital staff could not be more proud of Donna’s success and have been inspired to take ownership of their own health. Pictured above left to right: Laurie Klosterboer, John Cook, Sherri Juracek, Tonya Vyhlidal, Brian Coyle, Dave Heineman, Matt Becker, Dan Shestak, Michon Morrow, Kay Sudbeck, Matt Zimmerman, Jill Duis, Governor Pete Ricketts, Lauren Merchant, and Nicole Osborne. Dave Heineman was the recipient of the Lifetime Wellness Ambassador Award. Dave has been the champion of many of Nebraska's biggest initiatives regarding worksite wellness, with the Governor's Wellness Award being one of the largest successes. Brian Coyle, Physical Activity Coordinator for the Nebraska Department of Health and Human Services was the recipient of the Leading by Example Award. Sherri Juracek with the Arbor Day Foundation was the recipient of the Leading by Example award. Sherri has been the leader of many health and wellness initiatives at the Arbor Day Foundation. She has helped lead many activities that resulted in health screening improvements. Sherri is the true definition of a leader who is passionate about health and wellness and leading by example! Matt Zimmerman, Co-Owner of Source. Eat Fit! was the recipient of the Breakthrough Leader Award. Matt and his sister created Source. Eat Fit! in 2014 to provide individuals in Lincoln with healthy, convenient, and fresh meals on the go. Since the doors have opened, the store has made an impact on an abundance of lives including one individual that was able to lower his diabetic numbers drastically within 23 days, allowing him to stay off medication. Captain Michon Morrow, Wellness Chair of the Lincoln Police Department was the recipient of the Breakthrough Leader Award. Michon realized the need for a program that facilitates and promotes healthy living to employees of the Lincoln Police Department back in 2012 when she formed the LPD Wellness Committee. Due to Michon's efforts, numerous opportunities are made available to all LPD employees. One of the programs helped to save the lives of two employees that were then diagnosed with life-threatening conditions. Jill Duis, Infection Preventionist and Certified Diabetes Educator with the Jefferson Community Health Center was the recipient of the Wellness Champion Leadership Award. Jill has made significant contributions to the advancement and promotion of health at Jefferson Community Health Center. Jill is a stroke survivor and has had a pacemaker for more than a third of her life. This drives her to spread the message about health and wellness in any way she can. Jill is a trained Diabetes Prevention Lifestyle Coach and helped start JCHC's Smart Moves diabetes prevention program. Matt Becker, HR Manager for Hexagon Lincoln was the recipient of the Wellness Champion Leadership Award. Matt helped kick off Hexagon Lincoln's wellness program for it's first year of health screenings and results based program last November. Since the kick off, Matt has been leading by example and putting his wellness on the top of his priority list. After his first health coaching session, Matt increased his daily average steps, improved his eating habits and has dropped 26 pounds. He has motivated and inspired not only his fellow wellness committee members, but also many of his other co-workers to start or continue their wellness journey. Barbara Pearson was the recipient of the Lifetime Wellness Ambassador Award. Barbara recently retired from the State of Nebraska DHHS and was recognized for being solely responsible and the first person to have a vision of worksite health as a public health strategy in the United States. Worksite wellness began as a business initiative in Omaha with the first worksite wellness council, WELLCOM. Following their successful example Barbara started the public health side of the movement in Nebraska with WorkWell and the Lincoln-Lancaster County Health Department. Barbara promoted worksite wellness for nearly 30 years. Barbara was also instrumental in supporting the development of Nebraska’s Governor's Wellness Award. Today the Centers for Disease Control use Nebraska as a model for the rest of the country due to Barbara’s vision. Dave Mlnarik, Executive Director of the Nebraska Sports Council, was the recipient of the Leading by Example award. Dave has been an active board member for WorkWell and a proponent of worksite wellness with the Live Well Challenge Series, giving teams of employees across Nebraska a fun way to compete and stay active throughout the year. His collaboration with WorkWell in providing a trusted and affordable resource for worksite wellness promotion has been exemplary. Greg Howe, Wellness Manager of Lincoln Industries, and Andy Link, Wellness Coordinator of LES were honored as Breakthrough Leaders. Greg and Andy have led wellness for organizations in our community who have been recognized as great places to work because they truly care for their employees. Both Greg and Andy have helped their organizations receive the Governor’s Wellness Award and have demonstrated positive business outcomes as a result of their wellness programs. Jane Hansmeyer of Norris School District, Larry Dietrich of LI-COR Biosciences, and Kim Pickerel, who is a registered nurse at Lincoln Surgical Hospital, received Wellness Champion Awards for their fantastic accomplishments. Jane and Larry were awarded the Wellness Champion Leadership award for making significant contributions to the advancement and promotion of personal health or the health of others. Jane Hansmeyer has been instrumental in teaching hundreds of professional educators and thousands of Nebraska students plan for and attain meaningful wellness goals. At age 55 Larry Dietrich joined the LI-COR running club and caught the running bug, by the age of 62 he has run 7 full marathons including the Boston Marathon. Now he is a champion promoter of running and leads the running club at LI-COR Biosciences. Kim Pickerel received the Wellness Champion Individual Award for making significant improvements to her own personal health after finding out through her company wellness program that she had high risk health issues. With the assistance of her organization she changed her lifestyle and lost weight, lowered her blood pressure, and improved her blood profile. Due to these changes she has gained energy and her health back. All these champions have been great examples to others and are proof of the great impact worksite wellness programs have on individuals. Haley Nelson of Speedway Motors was the recipient of the Wellness Champion Leadership Award. Haley demonstrates hard work, perserverance, and commitment to not only her own wellness, but also the wellness of her co-workers. Haley volunteers with Speedway's fitness programs and wellness events. If you are ever looking for Haley during her work breaks, you can find her on the walking train no matter the weather. Dan Shestak of Lincoln Surgical Hospital was the recipient of the Wellness Champion Leadership Award. Dan's weight was beginning to cause some health issues. He recently came to the conclusion that he needs to make his health a priority. Dan lost 12% body fat in the past year and improved his blood pressure. He improved his systolic by 54 points and diastolic by 20 point. He reduced his glucose by 29 points. The health improvement Dan has seen as a result of improving his overall lifestyle has had a major impact in his life; he takes less medication, is less fatigued, and enjoys life! Pictured above, left to right: Larry Dietrich, Greg Howe, Dave Mlnarik, Barbara Pearson, Kim Pickerel, Jane Hansmeyer, and Andy Link.